Advertiser.ie - Will it be second time lucky for JPK Fencing? 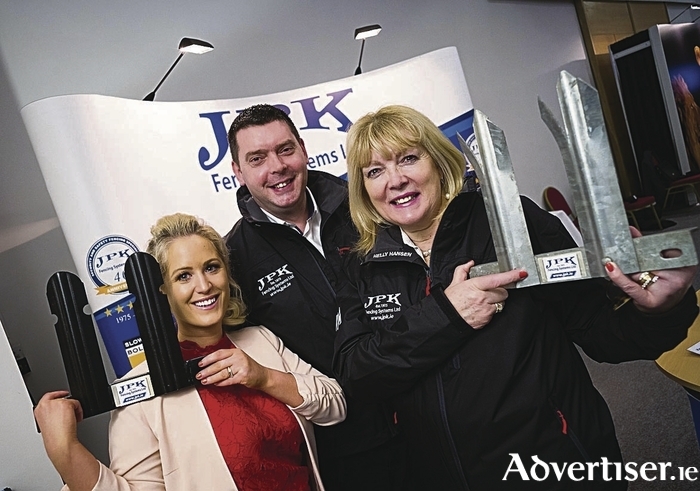 Claregalway-based business JPK Fencing was among the finalists in this year’s SFA National Small Business Awards who attended the recent Showcase event on Wednesday 1st February. Pictured are Michelle Kells, Energia and Kenneth and Bridget Kearney, JPK Fencing. JPK Fencing, who are based in Claregalway, could go all the way in this year’s SFA National Small Business Awards. This is the second time in-a-row that they are finalists in the competition. The annual SFA National Small Business Showcase event provided an opportunity for the 35 finalists in this year’s awards to market their products and services. The finalists are from a variety of sectors and 15 different counties (further details on www.sfa.ie/awards ).The awards profile entrepreneurship, innovation and creativity at its best. Minister for Jobs, Enterprise and Innovation, Mary Mitchell O’Connor TD, officially opened the event. The awards will be presented at a Gala Awards Ceremony in the RDS in March. A generous prize package of €50,000 is awarded to all shortlisted finalists with additional prizes for the overall winner. Energia has a 26% market share of the Irish business electricity and gas market supplying the energy needs of almost 60,000 business customers. In addition to over 800MW of renewable assets, the company also operates a 750MW gas fired power station in north Dublin and has great offers for domestic electricity and gas customers across the island. Energia has offices in Dublin, Galway, Cork and Belfast.